A MRI (Magnetic Resonance Imaging) scan uses a strong magnetic field to produce high quality images of the internal structure of your body. MRI scans are painless and one of the safest medical procedures currently available, as there is no radiation exposure. There are no known harmful effects from the magnetic field. However, patients who may have any metallic material within their body must notify their doctor and the radiographers before the scan. Metallic materials can significantly distort the images obtained by the MRI scanner, and any loose metal object may cause damage or injury if it gets pulled rapidly toward the strong magnet. A neurostimulator anywhere in your head or body. A pacemaker or implantable cardiac defibrillator. An artificial heart valve, arterial clips, a cochlear implant, or aneurysm clips. A programmable shunt for hydrocephalus (fluid on the brain). Metal fragments in the eye, head or body (you will likely need an x-ray BEFORE the scan). It takes 20-30 minutes per body part, which usually includes 4 sections lasting 4-5 minutes each. You will also need to remove all metal items, including jewellery, watches, hair clips and credit cards. Your clothes and personal items will be kept in a secure place. If you need to change there is a changing area available. 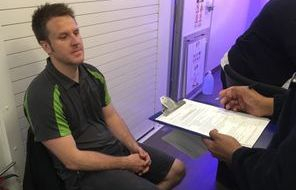 During the scan you will lie on a bed, which will move into the scanner either head first or feet first, depending on the type of scan. You are given headphones for listening to music, and to reduce the noise from the scanner. You can also hear instructions from the MRI radiographer, who will keep an eye on you and you can contact them too using a buzzer if needed. Sometimes the scanner can feel enclosed, but now more spacious “open” and “wide bore” MRI scanners are available, with ambient themes viewed from a mirror above. Sometimes patients prefer “wide bore” scanners, as there is more space above your head. Relaxation and stress relief techniques can also work well, and mild sedation is also available if needed. 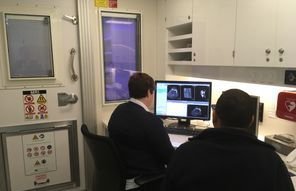 MRI scan of Brain with MRA scan of Brain and Neck - special protocol for MMA competitors and other contact sports - this usually takes 45 minutes. In 1937 nuclear magnetic resonance was discovered and this phenomenon was developed into magnetic resonance imaging (MRI) in 1971. The first MRI scanner was built in 1977, with rapid improvements in the imaging of soft tissues than previously seen with x-rays. In 1882, Nikola Tesla discovered the rotating magnetic field, and his name is used to calibrate its strength. A stronger magnetic field increases the number of radio signals emitted from atoms in the body. Most MRI scanners use a 1.5 Tesla strength magnet, but now some use 3 Tesla magnets, which can give higher quality images or reduce scanning times. Cobalt Health operates the only 3 Tesla mobile MRI scanner in Europe. The magnetic field of a MRI scanner is up to 4000 times stronger than the earth’s magnetic field. Using liquid helium, the magnet is cooled close to absolute zero, to enable superconducting. At this temperature, the MRI scanner will always be working, but in an emergency, the liquid helium can be released, turning off the magnetic field within a few seconds. This “quench” is a big deal, as the scanner will be off line for a week or more, the magnet can be damaged, and it will cost at least £30,000 to replace the liquid helium. Every year about 20 million patients now get a MRI scan, and over 1 billion MRI scans have been performed in total since the 1970s. Functional MRI, which can be used to show the location of mental processes in the brain, and how the brain responds to outside events. Smaller more portable MRI scanners are in development, mostly for imaging the limbs. Multiband imaging is also in development, which significantly reduces scanning times.